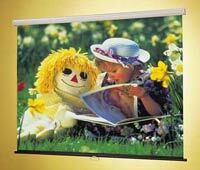 The Star spring-roller operated screen offers economy and durability in a classroom screen with sturdy cylindrical steel case and endcaps. Heavy gauge endcaps form universal hanging brackets for attachment to wall, ceiling, or map rail hooks. Tearproof, flame retardant fiberglass matt white offers a sharp image from any viewing angle.